Andrew Luck may begin the season on the PUP list. Being on the PUP list to begin the season would mean he’d miss the first six weeks of the regular season. Luck graded as the fourth-best quarterback in 2016, earning an elite grade of 91.6. It was a 39.4 point increase, the highest of any starting quarterback, from Luck’s 2015 season where he earned a grade of just 52.2. 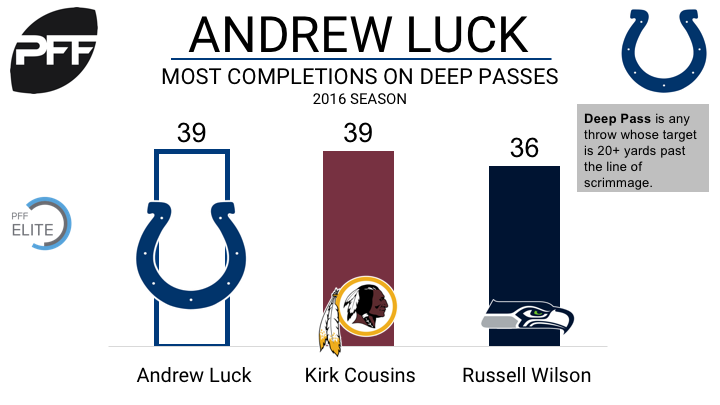 Showing off his ability to throw deep last season, only QB Ben Roethlisberger (13) had more touchdowns on deep passes than Luck (11). Tolzien has 253 career snaps under his belt, with his only start in the last three seasons coming in week 12 last season against the Steelers. During the 2016 preseason though, he demonstrated an ability to be accurate while under pressure, leading all quarterbacks with a 92.3 adjusted completion percentage (min. 50 drop backs). Tackle Ryan Clady is hanging up his cleats. After a nine-year career, Clady is reportedly going to retire. Clady’s best seasons came in 2008, 2009, 2010, and 2012 where he earned grades of 79.5, 84.7, 83.9 and 86.7, respectively. He ranked in the top 10 at his position each of those years. Clady was always a strong pass blocker even in his lower graded seasons. During the seasons highlighted above, he never ranked outside the top 25 in pass blocking efficiency among both right and left tackles. The Boise State product’s highest graded game (89.0) came in week 3 of 2012 where he didn’t allow a single pressure over 60 pass blocking snaps. Vic Beasley spent time this offseason working with DeMarcus Ware. Even after leading the NFL in sacks last year, Vic was reportedly looking to improve his overall game. Beasley wasn’t as consistent rushing the passer as his placement as the NFL sack leader might suggest. His pass-rush productivity of 10.4 ranked 32nd out of 110 qualifying edge defenders. He notched 45 total pressures on 388 pass-rush snaps. 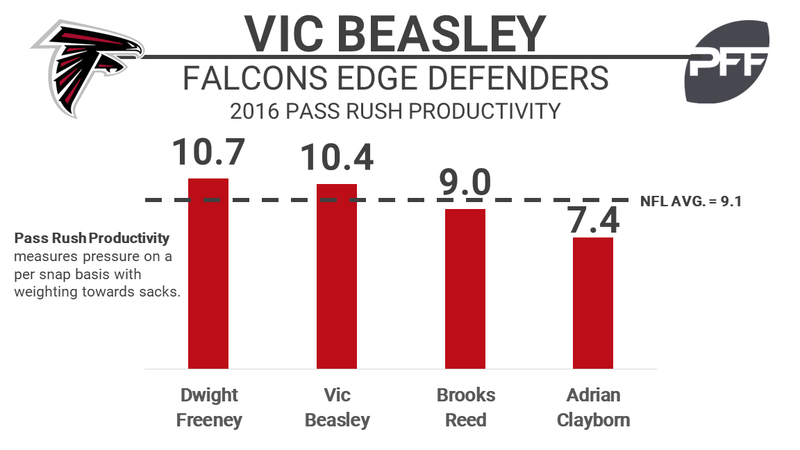 Overall Beasley was a solid contributor for the Falcons in 2016. His 74.2 overall grade ranked 50th out of 110 qualifying edge rushers. Beasley struggled defending the run in 2016. His 41.8 run-defense grade ranked 94th among qualifying edge defenders and his 4.1 run-stop percentage ranked 95th out of 113 qualifiers. The Cincinnati Bengals S George Iloka will be out three to four weeks. The defender was diagnosed with a sprained knee. Last season, Iloka finished with an overall grade of 75.0, which put him 53rd out of 90 qualified safeties. Iloka was ninth out of 56 qualified safeties in coverage snaps per target at 22.7, and he was second in the AFC North, trailing only Eric Weddle at 26.8. The Seattle Seahawks and Kam Chancellor agreed to an extension. It is reportedly worth $36 million over 3 years, with $25 million guaranteed. 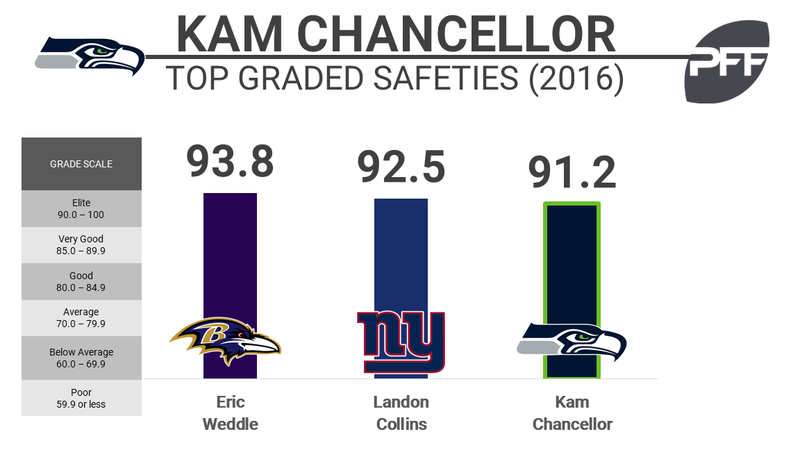 Chancellor is coming off the best season of his career, in which he earned the third-highest overall grade among safeties at 91.2 overall. Chancellor and fellow safety Earl Thomas are the second-highest-graded safety duo heading into next season. Keeping them together long-term is a win for the Seahawks. In 2016, Chancellor was both incredibly productive defending the run, earning the sixth-highest run-defense grade among safeties at 90.0 while racking up 35 defensive stops, which ranked third and in coverage earning the sixth-highest coverage grade at 86.2. His five pass-breakups ranked sixth among safeties.